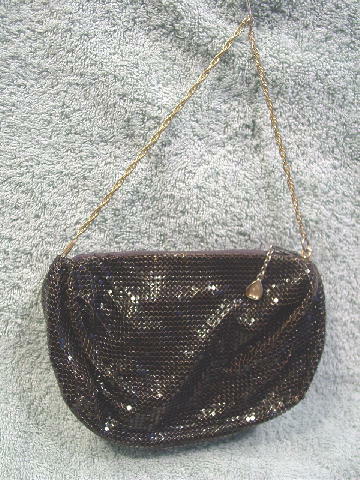 This vintage black mesh metal purse is by Whiting and Davis. It has a top side to side zipper opening with a metal gold-tone logo pull on a small tarnished link chain with a 12" long multi-link gold-tone handle. The chain is attached on one side by a cylinder shaped anchor and on the other side by a circular anchor. It has a black fabric lining with Whiting and Davis written all over it in reddish-brown letters. 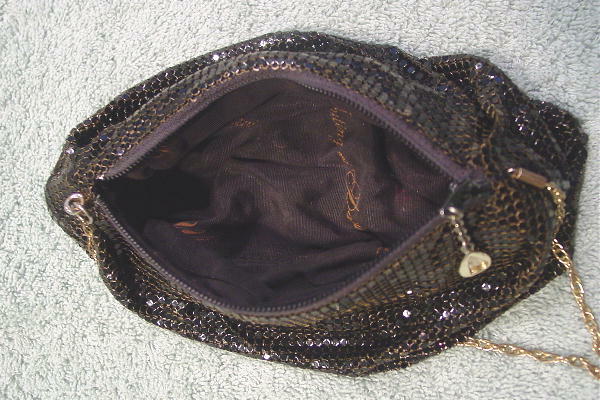 The outer mesh hangs free (except along the top opening) from the lining.